In former times, when there were no firearms, Kung Fu was very important for self defense. A person who mastered Kung Fu reached a high status in the feudal society. Usually Kung Fu was taught in rich families in Taoist and Buddhist temples, or in the inner circle of the Emperor. This knowledge was strictly protected and exclusively passed on in closed circles. Things have changed with times and Kung Fu traditions are now transmitted in different schools throughout the world. 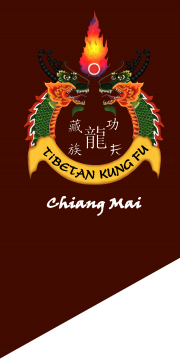 Master Joe Kherliang, master of Tibetan Kung Fu, believed was important to share with others the knowledge he acquired from his family and from other Masters, in order to help them strengthen their minds and improve their lives. What is Kherliang Tibetan Kung fu Style? Kherliang Tibetan Kung Fu is a really old family style that bears the effigy of the dragon. It has been handed down from generation to generation in Master Joe’s family. This ancient style combines influences from Tibetan, Chinese and Mongolian Kung Fu as well as the Dragon style. It is practiced bare hand or with traditional weapons that each have their own nature and help strengthening different parts of the body. When practicing with the double sword, attention is mostly given to posture and grace while the stick calls for focus on coordination. Animal styles such as Dragon, Tiger, Snake, Drunk, Crane are part of Tibetan Kung Fu and offer movements and techniques that match different types of bodies and personalities. The principles soft and quickly- soft and strong, strong and quickly, reserved and advance. Kherliang style such as the traditional family style and another style. The Footwork style is practiced on wooden slabs. It moves in all four directions and is related to the deeper philosophical meaning of Tibetan Kung Fu, which is rooted in Taoism and Buddhism. To preserve the art Kung Fu fighting. To promote physical and mental health. To share knowledge and experience about martial arts.